Decorative Concrete Paving in Cork has been called many different types of names over the years, from cobblelock, stamped concrete, imprint concrete, matcrete, pattern imprinted concrete, coloured stamped concrete and a multitude of many other variations of what is basically the same thing. It is perfect for driveways and patios. 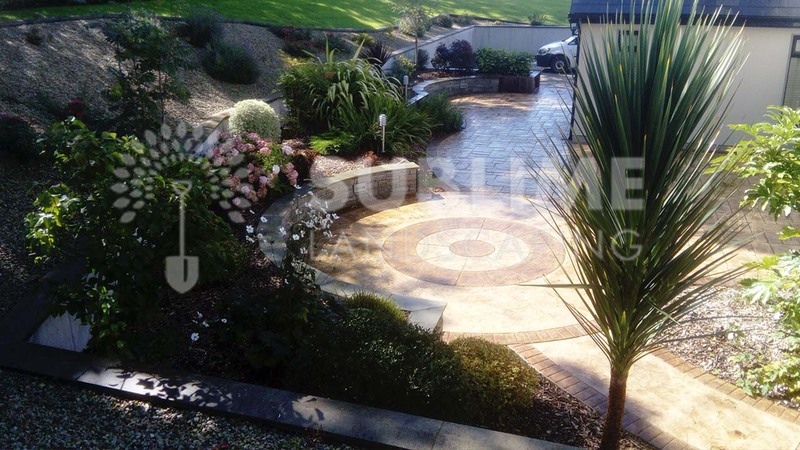 Sublime landscaping have a huge range of quality produced work in decorative concrete paving around Cork and surrounding counties. As an alternative to natural paving, we offer all customers decorative concrete as an alternative to natural products used in landscaping projects. 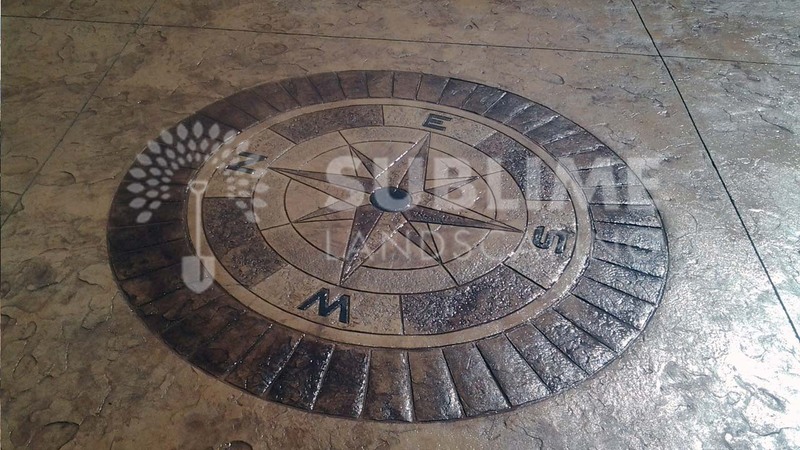 Decorative concrete is a colored concrete slab that is colored , antiqued and then patterned or embossed using molding mats to resemble brick, slate, flagstone, stone, tile, wood, and various other patterns and texture. 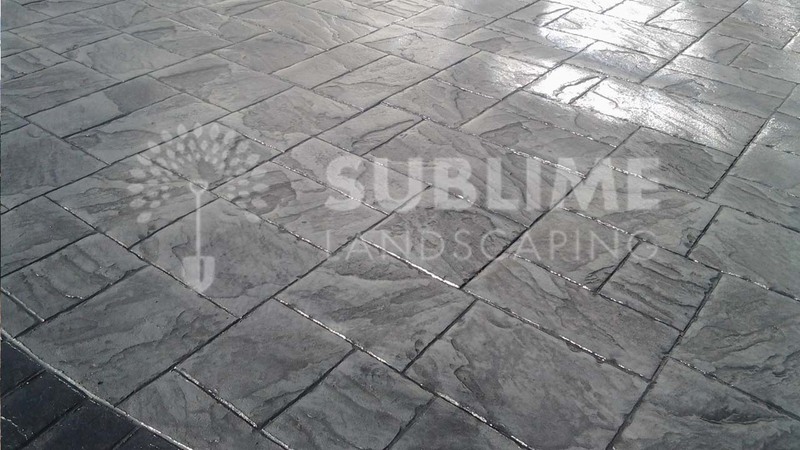 Decorative concrete is commonly used for patios, footpaths, driveways, courtyards, and interior flooring. Imprinted concrete is a fabulous but fickle product, and requires great attention to detail to make it work. 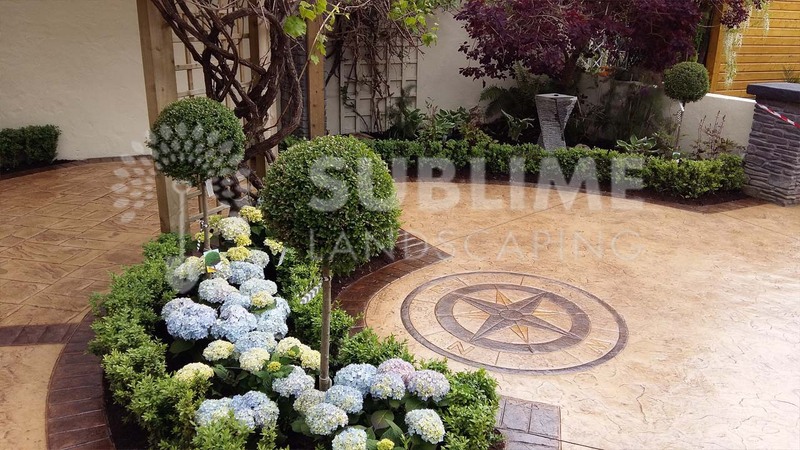 Sublime Landscaping take pride in having a genuine association with this product for a long time, and offer it as an alternative to natural paving products if low maintenance and stain resistance is a major requirement for the client. All that it takes to maintain that beautiful look of decorative concrete is the very low cost application of another coat of sealer approximately once every four years. However you should take into account the weather conditions of your area to make the determination. The majority of issues with decorative concrete arise from jobs not been re-sealed when they are due. As a result of this, the concrete becomes porous to the Irish elements and then it has the same faith as any natural paving product. The great benefit of decorative concrete is the aesthetic appeal that it provides and the multitude of surfaces and finishes that you can choose from. The visual design options are endless and can be suited to all different styles and preferences. 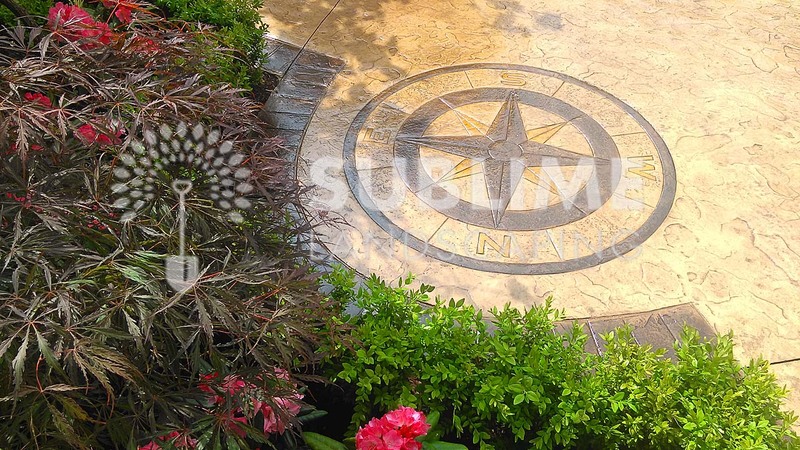 The stunning visual effect that Sublime Landscaping can produce from decorative concrete is created with the use of dyes, sealers and stains. Stamping can be done to add color to the surface, together with UV inhibiting materials to keep the pigment from fading in the summer months. Color can also be added through acid staining of the surface. The actual process is that there is a chemical reaction between the acid and surface which creates the desired effect. The durability of decorative concrete is one of the key characteristics of this particular material and the reason for its popularity. It can last longer than many comparable materials and withstand harsh climates and weather conditions. Additional features and benefits are that it is resistant to mold, dust and other allergens so you can provide a safe and healthy environment for your family. Decorative concrete is stain resistant to engine oil, diesel stains and other mechanical leaks. The real tipping point that makes decorative concrete so popular is its comparable price to natural paving products. If you need to stick to a budget when doing your home renovations, and require a low maintenance alternative paving solution – decorative concrete is your number one choice. Combined with its other benefits of durability and beauty, it is both functional and attractive. Yet in spite of the price, it certainly does not look it! You can create unique, head turning designs with decorative concrete.